HALO Fractional Laser Skin Resurfacing is a revolutionary technology that provides dramatic results for patients looking for a more youthful appearance. What is HALO Fractional Laser Skin Resurfacing? We are pleased to offer Sciton's new HALO treatment, the world’s first hybrid fractional laser that simultaneously delivers non-ablative and ablative resurfacing. This revolutionary technology produces dramatic results similar to more aggressive treatments, but with controllable downtime. The Sciton HALO Fractional Laser is the first real innovation in lasers in the last decade. We are proud to be among the first providers in the North Vancouver area to offer HALO Laser treatments. What are some benefits of the HALO Fractional Laser Skin Resurfacing? What makes the HALO Fractional Laser Different? An ablative laser has long been considered one of the most effective treatments for improving the signs of aging. By removing the outer layers of damaged skin, the skin is forced to heal, increase collagen production and restructure, making way for tighter, rejuvenated skin. The downfall of an ablative laser is the recovery and downtime needed, which can often be 1-2 weeks. A non-ablative laser treatment, on the other hand, is far less invasive and comes with little-to-no downtime. By heating up the outer layers of skin but not removing them, a non-ablative laser treatment is popular for patients who need to return to their everyday lives right after treatment, and don't have time for an extended recovery. The HALO Fractional Laser focuses energy on the deeper collagen layer of skin, leaving the surface of your skin largely intact for a quicker healing time. It delivers the results of an ablative procedure with little-to-no downtime, like a non-ablative treatment. That means you can get back to your daily routine much quicker! HALO is a complete skin rejuvenation treatment. You will see improvements in overall tone, texture and laxity in addition to significant removal of discolouration, reduction in fine lines, reduced pore size, skin reflectivity and glow. How many HALO Fractional Laser treatments do I need? What’s great about HALO is that you can choose how many treatments you want! We will discuss your needs and you can choose to have one or two more aggressive treatments or have multiple treatments that are less aggressive and achieve a similar goal over a longer period of time. Thirty minutes to an hour before the treatment, we will apply a topical anesthetic on your skin to reduce the sensation during the procedure. The area will be measured with motion tracking technology to ensure the area is treated evenly. We will treat each measured section by uniformly rolling the Halo handpiece over the skin until the system recognizes the treatment is complete. What does HALO Fractional Laser treatment feel like? With a topical anesthetic and integrated cooling technology, most patients experience very little discomfort. Most patients describe the treatment as a feeling of heat with occasional prickling sensations but are generally comfortable. After the treatment, most patients will continue to feel warm for an additional 15 to 30 minutes, or a bit longer with deeper treatment levels. For the first 24 hours, you should keep your skin protected according to your clinician’s instructions, but after that, you should be able to go about your normal activities. After the first 24 hours, your skin will begin to peel, but you will be able to put on makeup. For a facial treatment, you will see very little change on the first day. After two to three days you will develop a light bronzing appearance. By day three or four your skin will peel, revealing your new skin beneath. Our Halo results will last for years to come, but you should continue to keep your skin protected at all times using UV sunscreen to protect your new, healthy skin. Each additional Halo treatment you get will only improve the results, giving you even better-looking skin. Every Halo treatment is customized for your skin and your lifestyle. Depending on your needs, your provider may recommend a single treatment or a series of treatments. In order to find out which is the best option for you, please visit us for a complimentary consultation. Over the years, I have always worried about how much damage I’ve done to my skin. My freckles turned into brown spots and my pores were large. Halo not only made my skin feel and look amazing but it also reversed the internal sun damage. Halo hit the spot! The best part of my Halo treatment was how easy it was! I have done a few laser and light treatments in the past, but nothing came close. To be able to have a treatment with minimal discomfort, be able to go out the next day and still get results was amazing! Beautiful skin is just one visit away. 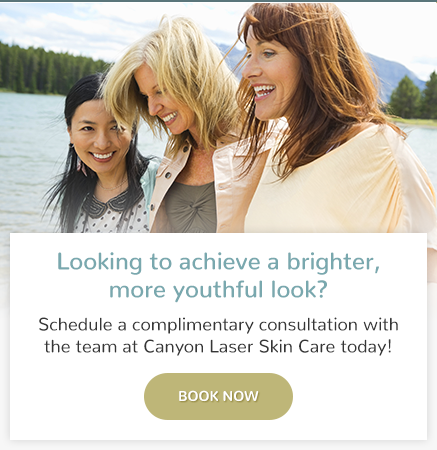 Contact Canyon Laser Skin Care in North Vancouver today.